Barbara Currie “Bobbie” Hardin, 79, of Henrico County passed away Saturday, April 6, 2019 after a courageous battle with a lengthy illness. She was preceded in death by her father, Alvin “Buster” Currie; mother, Helen Waddell Currie; and brother Alvin Ray Currie. She is survived by her loving husband of 57 years, Herman “Sonny” Hardin Jr.; one son, Kevin Hardin; one daughter, Kimberly Johnson (Brent); two grandsons, Stephen Gibbs Jr. (Maria) and K.C. Hardin Jr.
Barbara was a good friend to all she met. 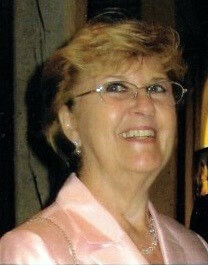 She was known for her love of the Bible and was a loving hospitable person, always having a warm, friendly smile. A memorial service will be held at 4 p.m. on Saturday, April 27 at the Kingdom Hall of Jehovah’s Witnesses, 2737 Hungary Springs Rd., Henrico, VA 23294(behind Steinmart). In lieu of flowers, donations may be made to Worldwide Work of Jehovah’s Witnesses at jw.org. I’m so sorry for this loss. She was a true treasure and I am going to make it a point to learn to bake with her in paradise. Please let me know if Mimi, Josh or I can do anything for you guys. Love you.